The clear water of Kampar River (Class I-III) is suitable for anyone who is physically fit and those who crave for mild technical adventure whilst safely enjoy a rafting trip. From the excitement of tackling large rapids, to enjoying the serene beauty of a gentle paddle through lush rainforest, this will be an invigorating day spent at one with nature. The Rafflesia is a species named by M. Cantley, curator of the Singapore Botanic Gardens (1880-1886). Widely known as corpse lily as a parasite gigantic species with roughly over 100centimetres (39 in) in diameter, and weigh up to 10 kilograms (22 lb). Even one of the smallest sizes has 12 cm diameter flowers! The trek to the Rafflesia is near a little village about 12km from Gopeng, near Ipoh, Perak. To get through the jungle to where the Rafflesia thrives, you need to engage the services of a Semai Orang Asli guide. The trek is hilly and some parts you really have to climb. Halfway up the hill, you can already smell the Rafflesia. Similar to the smell of rotting carcasses here and there. Rafflesia bloom is seasonal basis, make a confirmation first for good view of this flower. A long the way, you will meet the Orang Asli settlement and the national butterfly which namely as Rajah Brooke! The butterfly was named by the naturalist Alfred Russel Wallace in 1855, after James Brooke, the Rajah of Sarawak. The Rajah Brooke’s Birdwing is a species of rare V-winged butterflies that are native to the rainforests in parts of a few Southeast Asian countries! These butterflies gather in groups consisting of up to 80 individuals for drinking mineralized water from puddles in order to absorb sodium and potassium that they need for activating adult behavior! Hiking at Batu Putih is a one “to do list” in Gopeng, Perak. The name of Batu putih is coming from limestone which covered half part area of this hill. The unique of Batu Putih rocky area make it famous and suitable for the leisure hiking for the kid and adult. From the upper part of Batu Putih you will mesmerize the overall panorama of Kampar River and the villagers area during the sunset or sunrise! The hiking will take around 1 hour and 30 minutes depending on frequently of your selfie timing along the way up! This hill is so dramatically and photogenic, expect to stop and snap a photo picture! This hiking is recommended for the beginner and for the family trip which looking for mild adventure! Short briefing by the River Explorer guide and sign the indemnity form. Assemble and transfer to the trekking area. Arrive at the trekking area. Safety briefing will be given by RIVER EXPLORER guide. Rafflesia trekking & Rajah Brooke butterfly commences. The trekking will take about 3 hour journey! Take a short break at Rajah Brooke area for selfie and refreshment! Expected to walk down the starting point area and enjoy the river crossing and beauty scenery of Malaysia rainforest! The end of activity and get ready for refreshment with lunch and beverage! 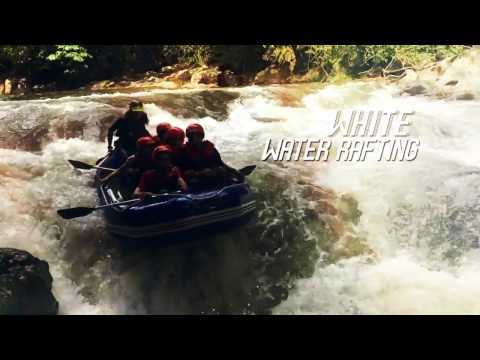 Assemble and transfer to the starting point for White Water Rafting. Arrive at the starting point. Equip with white water rafting equipment and safety briefing will be given by RIVER EXPLORER guide. Body rafting for water confident. White water rafting commences. Covering the distance of 7 km with 10 big rapids along the way. The journey takes arounds 1 ½ to 2 hours. Depends on client fitness. Arrive at the ending point and get ready for tea break! Short Break and free-time. Get ready for shower and changing clothes. Short briefing by the River Explorer guide and sign the indemnity form. Assemble and transfer to the hiking area. Arrive at the hiking area. Safety briefing will be given by RIVER EXPLORER guide. Hiking Batu Putih commences. Enjoy the mesmerize view of sunset at the top of Batu Putih! Take a short break at the upper hill for selfie and refreshment! Expected to walk down the hill area. The end of activity and transfer to the River Explorer office get ready for shower and changing clothes. 2. Boost up your adrenaline with the thrill of crashing through the waves and being bucked in the air! 3. Enjoy the nature and wildlife view along the Kampar River! 4. Trekking to the World Biggest Flower in world! 5. Meet national butterfly of Malaysia RAJAH BROOKE BUTTERFLY! 6. Experience the thrill trekking and culture trip of Orang Asli Village! 1. Sport attires. Long pants are advisable. 2. Full covered shoes and wear long sock preventive action from leeches! Take bus ticket from Ipoh Amanjaya Bus Station to Gopeng bus station. There are no public transport to the office. So, Taking a grab car/taxi from Gopeng town is the fastest and easiest way to get to the meeting point. Rearrange the schedule time line or changes to other activity. All the safety equipment will be provided by us! No worry!